The color (British "colour") company Pantone dictates an official color of the year every year and it is one of the most exciting things that I look forward to in life. For the forthcoming year of 2016 they have decided that we need two colors to be the color of the year. This has so many implications and raises just as many questions. TLDR: Pantone is a company known for their proprietary color matching system. It allows designers to achieve predictable results across a variety of media from assorted printering mechanisms. What is a Color of the Year? It's basically a marketing thing. Marketers in their smooth doublespeak will throw out buzzterms like "zeitgeist, emotion of the times, captivating, culture" and so on. It doesn't mean anything. Does anything mean anything, though? What is meaning? We're still living it as I type this. It should be so easy to see. It is everywhere around you. The color is so ingrained into our lives it is the essence of mood in our collective consciousness for the year. Without doing a search say the name of the color of the year of 2015 aloud. You don't even need to say the correct trademarked name, just say the color as best you know how. Ready? Did you say an orangeish-brown color? Haha, wrong try again! Oh now you remember, it was kinda bluey, right? Maybe blueish-reddish-green-yellow? You have no idea! Haha! I could do this for hours with you. They call it "Marsala" (#18-1438) and it looks purpleish on my computer monitor. Maybe more burgundy-maroon. Now I'm looking at pictures of chicken marsala, which oddly enough is more of an orangeish-brown color. And now I'm looking at pictures of Wynton Marsalis and okay let's move on we're getting off track. Is the Pantone COTY Relevant to Anyone? Now that you know the color of 2015, can you recall seeing it anywhere? Maybe the pillows at TJMaxx. Or an eyeliner at the makeup counter of your Sears department store. Possibly the color of the underwear on the models of Victoria's Secret Fashion Show which is tonight (assuming I can get this article past the editors in time). Did you know that CBS News has an article on how to watch the Victoria's Secret Fashion Show, featuring a 64 photo slideshow? I want to be dismissive of the COTY, but I can't because I remember a certain scene from The Devil Wears Prada (which I think is basically Star Wars re-written for girls (not that girls can't like starwars or guys cant like devilwearsprada) (and star wars is basically re-written from the bible)). Take a minute-fifty-one and watch that youtube video. I'll wait. Well. What is the 2016 COTY? I'm assuming you have internet access if you're reading this. And since the PantoneCOTY is such HUGE news you've probably already read 4 or 5 web e-articles about the two colors that will reshape or lives in the next year. 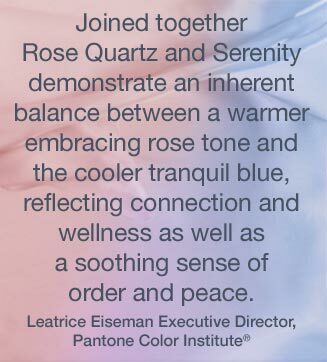 But just to be thorough, those colors (Leet "c010rZ") are Rose Quartz and Serenity. Rose Quartz is pink. Serenity is blue. These are baby room colors. Is Pantone encouraging or predicting a new baby boom in 2016? Is this tied in with the government defunding of Planned Parenthood? Sidebar: Conspiracy contradiction: The global elite want to depopulate the world and sanction people in to sections a la Hunger Games districts (see Agenda21 (and extrapolate)) but also want to expand their tax-payer base. Seriously, Though, Why the Leap to Two Colors? One color that no one pays attention to was enough. Why did Pantone make the leap to 2 colors that go generally disregarded? You guys, the balance is inherent. It will bring order and peace. In the form of US drone strikes in sand-countries. Or at least the sense of order/peace. These colors are also reminiscent of cotton candy. Evoking feelings of sweetness and joy. What is the greatest quantity of cotton candy you think you could eat? Measured by volume, I think I could probably pound down a 55-gallon barrel of the fluffy stuff before my body rejected it or went into shock. I dunno, though, that's a limit I've never tested. I might surprise myself in my ability to consume spun sugar. And you might too. Dare to dream!